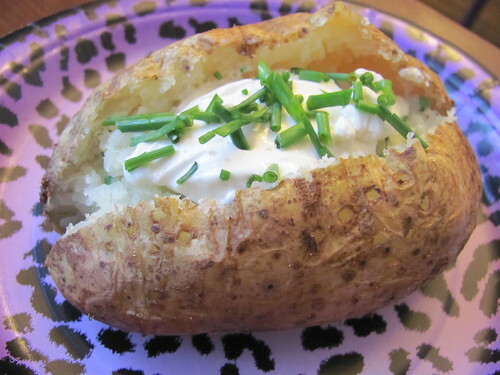 I love baked potatos, and this is my favorite! Preheat your oven to 400 degrees F. Select a large potato and wash it (scrub!) and remove the eyes and blemishes. Coat the potato with olive oil, and sprinkle with spices! I chose salt, pepper, thyme, cumin, and cayenne pepper. Place the potato in the oven directly on the rack, and bake for one hour. When the potato is done, poke a line across a flat side with a fork, and give your potato a squeeze. It will pop open. 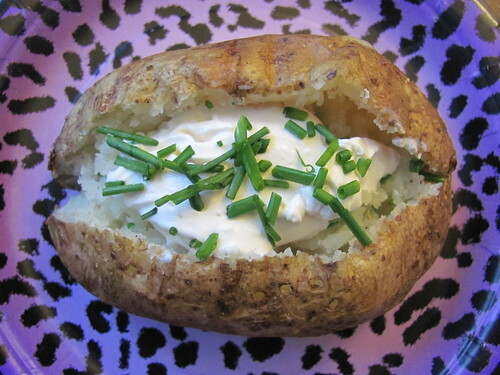 Top with soy sour cream and fresh chopped chives!